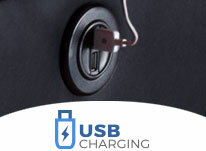 USB port is available in the power recline switch. Looking for a wide-seat modular group with oodles of style and enough versatility to fit in virtually any space? Welcome to the ECLIPSE. An oversized radius arm combined with a distinctively shaped wing will quickly make the ECLIPSE the center of attention in any setting. This contemporary reclining piece is proudly made in the USA with attention to detail throughout. Notice the French single-needle seams on the arm and wing edges.A single partition is used as a unifying design element in the pad over chaise seat and bustle back. The back also has a shaped side boxing to match the wing. 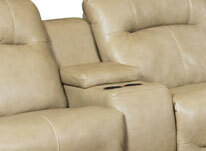 These are some of the most popular configurations for this home theater furniture group. If you have any questions about a custom setup you would like to purchase please call one of our expert sales personal at 1-800-407-8665. Fabric material offers a wide array of texture, color, and pattern options along with a warm, inviting ambience that exudes down-home comfort. Larger and smaller grains, stitching, and patterning give each fabric its own particular style; with many different options to choose from, you are certain to find something which matches your needs. A water-repellent coating helps protect from stains. Duralux fabrics from Southern Motion is a mixture of polyester and polyurethane that offers the touch of plush leather but is a highly breathable material. This is an easy to clean and extremely durable material that will provide long lasting use for you and your family. Leather Rich is a new grade of leather designed for everyday use by any active family. It offers the distinctive aroma and feel of leather while maintaining its durability and ease of care. Top grain leather (with leather match on the back) provides the luxury sheen, sumptuous feel and rich texture that is prized among seat owners, for an optimal combination of design and comfort. The silky softness of these fine leathers will enthrall the senses, and are available in 14 elegant colors.